The GLCA map covers in extent all of the park, as well as Rainbow Bridge National Monument, and portions of Canyonlands National Park, Capitol Reef National Park and Grand Canyon National Park. The map is also available in KMZ/KML format for use in Google Earth. The map is produced by the NPS Geologic Resources Division as part of the Geologic Resources Inventory (GRI) program. In addition to the digital geologic maps, the GRI program also produces geologic reports that tie the digital geologic map to the geologic features, issues, and processes relevant to geologic resource management. The report for GLCA is forthcoming. The National Mining Association reports that "according to the Bureau of Labor Statistics, in one year – between June 2010 and 2011 – coal mining jobs grew 7.6 percent, metals mining jobs grew 3.9 percent, and jobs in support activities for mining grew at a rate of 19.2 percent." Meanwhile, value of mineral production in Arizona rose to $6.972 billion in 2010, up from $5.680 billion in 2009, a 23% increase, as noted in the 2010 Arizona Mining Review, authored by AZGS minerals geologist Nyal Niemuth this week in our online news magazine, Arizona Geology. 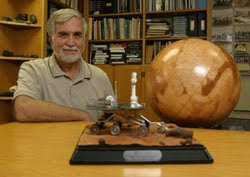 Greeley, a pioneer in the planetary geology field, served as the director of the NASA-ASU Regional Planetary Image Facility and principal investigator of the Planetary Aeolian Laboratory at NASA-Ames Research Center. He served on and chaired many NASA and National Academy of Science panels and he was involved in nearly every major space probe mission flown in the solar system since the Apollo Moon landing. Mission projects included the Galileo mission to Jupiter, Magellan mission to Venus and Shuttle Imaging Radar orbiter around Earth. He was also part of the data analysis program for the Voyager 2 mission to Uranus and Neptune. His projects focused on the moons of these distant bodies. Passionate about Mars exploration, he has been involved with several missions to the Red Planet, including Mariner (6, 7, 9), Viking, Mars Pathfinder, Mars Global Surveyor and the Mars Exploration Rovers. He is a co-investigator for the camera system onboard the European Mars Express mission. A Facebook page dedicated to Professor Greeley will also be updated with related information: http://www.facebook.com/profile.php?id=100003109532235&sk=wall. BLM historically has managed public lands in the western states, while OSM focused on Eastern coal mining and reclamation on private lands. 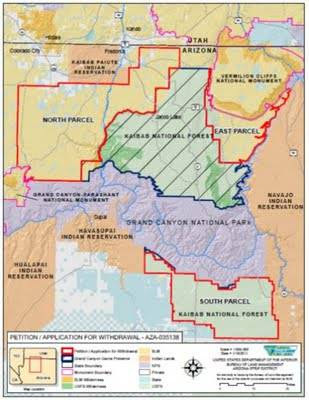 BLM says they administer 12.2 million surface acres of public lands in Arizona, along with another 17.5 million subsurface acres within the state. The news story says the merger is going forward without asking for Congressional approval. A new fact sheet from the USGS notes that "Recurring drought and rising temperatures have caused reactivation and renewed growth of sand dunes on the lands of the Navajo Nation on the Colorado Plateau. Migrating dunes threaten health, housing, and transportation pathways." 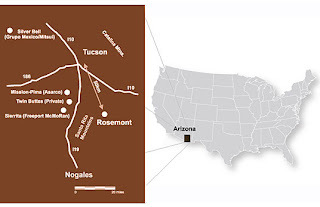 Ref: Redsteer, M.H, Bogle, R.C., and Vogel, J.M., 2011, Monitoring and analysis of sand dune movement and growth on the Navajo Nation, southwestern United States: U.S. Geological Survey Fact Sheet 2011–3085, 2 p., available at http://pubs.usgs.gov/fs/2011/3085/. I had the privilege of giving the keynote address to the Shlemon Specialty Conference in Tempe this morning on "Opportunities for Alternative Energy Development in Arizona and the Southwest– Geologic/Hydrologic Considerations." The event was organized by the Association of Environmental and Engineering Geologists (AEG) and the Arizona Land Subsidence Group. The technical conference drew about 110 attendees from geotechnical companies, utilities, and energy developers. 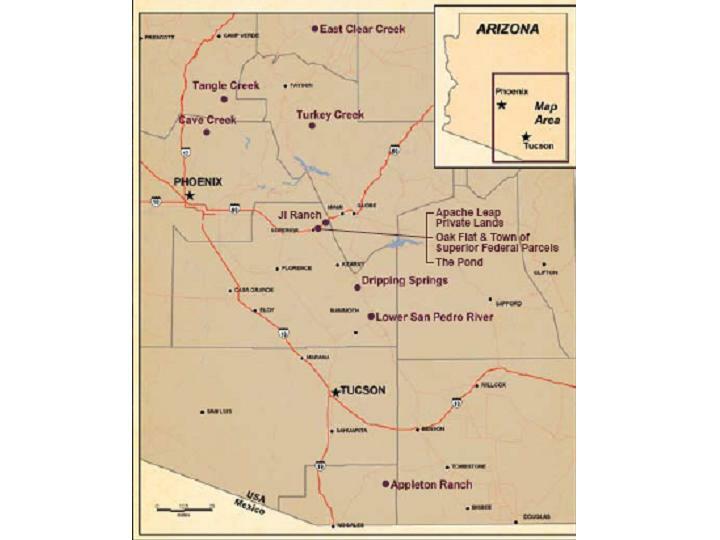 I offered an overview of the types and locations of proposed renewable energy projects or areas of potential development, along with a summary of the types of geologic hazards that occur in Arizona and surrounding states, that need to be factored in construction. The House voted along party lines to approve the swap of 5,350 acres of lands they acquired for their conservation value, for 2,422 acres of federal lands needed for the proposed Resolution Copper underground mine to be developed [right]. Resolution Copper is a joint venture between Rio Tinto and BHP, the two biggest mining companies in the world. The mine is projected to produce 20-25% of the total U.S. copper demand for as much as 40 years. The House debate turned acrimonious over challenges made by mine opponents that Rio Tinto owns a majority interest in a uranium mine in Namibia, that is also partly owned by an Iranian company. Supporters of the land exchange argued that it would not affect sanctions on Iran. The bill must now go to the U.S. Senate. The U.S. Bureau of Land Management has called for a 20 year ban on mineral exploration and mining on nearly 1 million acres of federal lands in northern Arizona, as the recommended alternative in the Environmental Impact Statement released yesterday. After Sec. of Interior Ken Salazar publicly chose that alternative when the Draft EIS was released this summer, it was widely expected that BLM would not challenge their boss. The EIS is open for public review [update: the original post said it was open for comment. In fact, no comments will be accepted but 'messages' may be sent to BLM. Comments would have to be recorded and considered in the evaluation] for 30 days, but with Salazar having already announced his decision, this appears to be moot. 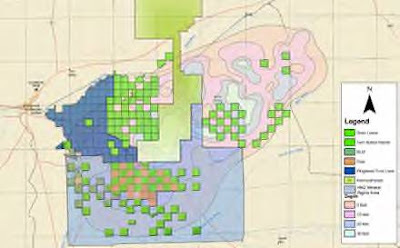 Alternative B, the Proposed Action: the proposed withdrawal would be implemented and the entire 1,006,545 acres of federal locatable mineral estate within the three parcels would be withdrawn for 20 years from operation of the Mining Law, subject to valid existing rights. New exploration and mine development proposals could continue to be authorized by the BLM or the Forest Service only on mining claims where valid existing rights are determined to exist, in accordance with applicable laws. The mitigation of potential effects from exploration or development would continue under the applicable surface managing agency regulations. This is also the Preferred Alternative selected by the Secretary after review of public comment on the Draft EIS. Although this alternative would allow activity on 'valid existing claims' Interior Dept. officials earlier this year indicated they could reinterpret the laws to require proof of the presence of economically recoverable minerals before any exploration would be allowed on those claims. However, since the purpose of exploration is to prove up those resources, such an approach would de facto halt exploration and possible subsequent mining. If Interior pursues this course, mining companies say they will fight it aggressively. They argue it would effectively halt all exploration on federal lands nationwide. As of 8 pm tonight, 540 people have reported they felt the event on the USGS website. The area has had little historical seismic activity. 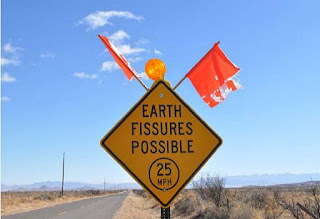 AZGS recently posted two short videos on fault activity on the Little Chino and Big Chino faults. 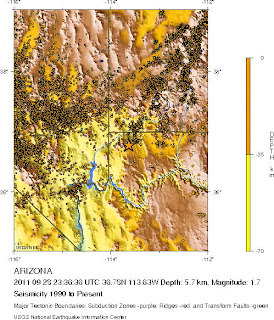 update 10-16: The Prescott Courier reports that the magnitude is revised to 3.2 and the location based on additional analysis by Dr. David Brumbaugh at the Arizona Earthquake Information Center at Northern Arizona University. The Geothermal Resources Council annual meeting launched last night here in San Diego in partnership with the Geothermal Energy Association industry trade show. AZGS has an exhibit booth where project manager Kim Patten and I are running demos of the State Geothermal Data project. AZGS is the prime contractor of the largest Dept. 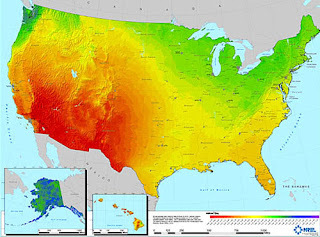 of Energy Geothermal project in the country, to digitize data from state geological surveys in all 50 states, and add them to the National Geothermal Data System. AZGS is also a subcontractor to build the data integration platform for the NGDS. Our online catalog now has over 34,000 data resources, linked to over 600,000 data sets hosted by state surveys around the country. That number is growing weekly and will continue to do so for the next two years while we populate the emerging system. The sprawling Town & Country Hotel where the meeting is being held is sold out and overflow attendees are being sent to other nearby hotels. We had a steady stream of visitors to our booth all evening long and lots of interest from others in adding their own data into the network. The meeting reflects the excitement in the geothermal industry. Technical talks begin today. On Tuesday, Dave Blackwell and his team from Southern Methodist Univ. in Dallas, will present their new geothermal potential map for Arizona and New Mexico. We'll post updates. Mineweb.com warns that "the strike and unrest at Freeport's Grasberg operation in Indonesia could, if they continue and by virtue of the mine's size and output, have an important impact on global production of both copper and gold." "Freeport-McMoRan managers, national staff, contractors and some union workers" are reported to be operating the Grasberg mine during the strike. "Before the strike, Freeport Indonesia's copper output was forecast to be 1 billion pounds in 2011, from 1.2 billion last year. Gold sales are expected to hit 1.3 million ounces this year, versus 1.8 million ounces in 2010 and 2.5 million ounces in 2009." Prescott-area water officials are challenging the use of a recently completed USGS groundwater model for the Verde River system. Bill Meyer, "a retired USGS hydrologist with more than 40 years' experience in quantifying groundwater resources and the impact of wells on rivers," serves as a volunteer advisor to local groups in the area. He wrote a column in today's Prescott Courier, explaining the value of the model in light of "the unwillingness of Prescott-area officials to use the model for one of its major intended purposes, i.e., to assist state and local officials in the management of their groundwater resources." Hydrologists are united in the concept that groundwater and surface water are a single resource. 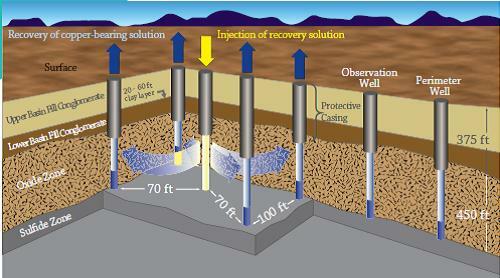 Thus pumping of groundwater will ultimately reduce the amount of water flowing to our springs, streams and rivers. It is clear from studies performed and data collected by the Arizona Department of Water Resources and the USGS that ground water pumping has reduced the flow of the Verde River. As pumping increases, this reduction will continue to increase over time. 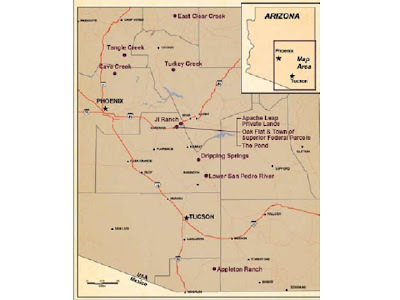 Unfortunately, the state of Arizona does not recognize the fact that groundwater and surface water are hydrologically connected and from a legal standpoint, essentially manages them as two separate entities. This fact significantly limits the ability of the state or individuals to protect Arizona's two remaining high priority rivers, the San Pedro and the Verde. This small fossa segment cuts the channel of Athabasca Valles, and post-dates the youngest of Mars' outflow channels. A "fossa" is a cavity or depression. Floods of water and lava are thought to have emanated from the larger fossae nearby, perhaps forming the Athabasca channel and later filling it with lava. Comparison with the larger fossa segments at the Athabasca Valles head may reveal whether this will be a source of a future flood. Did you know that ocotillo likes to grow on limestone? When you see dense clusters of ocotillo, there's a good chance that it's limestone below the surface. Arizona State University is involved in 7 space missions currently, with more in the wings. The new issue of the ASU School of Earth & Space Exploration's news magazine, SESE Source, has a number of stories about space, meteorites, and planetary exploration, including one on its space missions. I was particularly taken by the image showing the range of missions across the solar system that ASU has been involved with [right]. 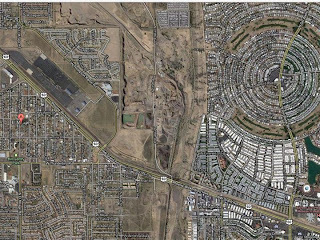 Proposed copper mines in Arizona are getting most of the news headlines these days, but a more common issue both here in Arizona and across the nation, is the encroachment of housing on sand and gravel quarries. To be economically viable, quarries have to be as close as possible to where the materials are needed for construction. A rule of thumb is that for each 30-40 miles additional that sand, gravel, or aggregate must be hauled, the price doubles. And that dramatically increases the cost of construction. So, quarry operators try to find areas adjacent to urban areas but away from areas that are likely to be developed in the near term. In fast growing Arizona, that hasn't always worked out, and many quarries are now surrounded by new residents who want the industrial operations shut down. Another possible factor, not mentioned in the news story, is a new state law that requires local governments to factor in aggregate and sand and gravel resource availability in their land use plans. The Fall public lecture series at the University of Arizona's Biosphere 2 focuses on planetary science in honor of Mike Drake, UA Regents' Professor, director of the UA Lunar and Planetary Laboratory and head of the department of planetary sciences who died recently at the age of 65. 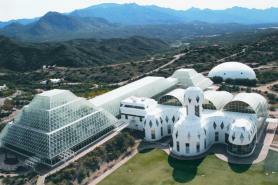 UA says the talks will be held at Biosphere 2 every Saturday at noon from Oct. 22 through Dec. 10, with the exception of Nov. 26. They are included with the cost of tour admission. 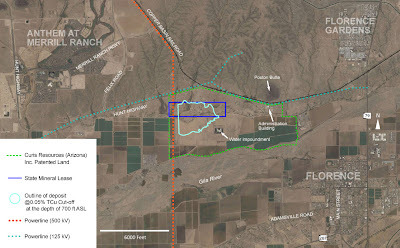 The copper project has pitted large land owners and real estate developers against the copper company, with residents bombarded with conflicting claims about possible groundwater pollution, taxes, jobs, and forecasts about eventual residential and commercial development of lands around the copper site. 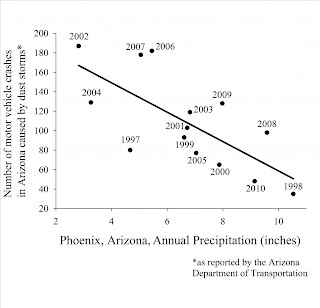 Higher rainfall in Phoenix correlates with a dramatic decrease in car crashes caused by dust storms. The USGS put out a short note following the October 4 dust storm in southern Arizona, noting that two contributing factors to such events are low vegetation cover and disturbance to soil surfaces. Vegetation contributes to ecological integrity. The presence of plants reduces soil erosion and dust storms, because it keeps the soil intact, reduces wind momentum, and traps moving soil particles. In spaces between the plants, many undisturbed desert soils are naturally armored by hardened physical and biological crusts. Low vegetation cover can especially be a problem in drought years in abandoned agricultural fields, which are generally dominated by annual plants. This means that the consequences of dust storms, including motor vehicle crashes, are high in a drought year and low in years with more precipitation. 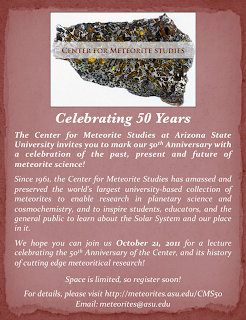 The Center for Meteorite Studies at Arizona State University celebrates its 50 years of cutting edge meteoritical research, as well as building world class meteorite collection on Friday, October 21. 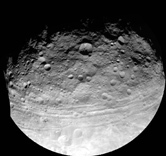 The Center is offering a free evening lecture Friday night by Tim McCoy from the Smithsonian, on the NASA Dawn mission to asteroid 4 Vesta. When I checked a few minutes ago, a few tickets were still available. Go to http://cmsanniv ersary.eventbrite.com/. CMS is home to the world's largest university-based meteorite collection. Two public meetings regarding the Rosemont Copper Project Draft Environmental Impact Statement (DEIS) will be rescheduled. The first and last meetings, scheduled to be held at the Desert Diamond Conference Center in Sahuarita, Arizona on October 22 and January 7, have been postponed and will be rescheduled. The Coronado National Forest will soon accept public comments on the DEIS in a variety of formats. Six public meetings have been scheduled for informational and comment sessions. potential conflicts, the Forest is rescheduling meetings as needed. The October 22 meeting, in Sahuarita, will be rescheduled to avoid potential conflicts with the National Park Service, Saguaro National Park’s BioBlitz, a major event with widespread community and interagency involvement. 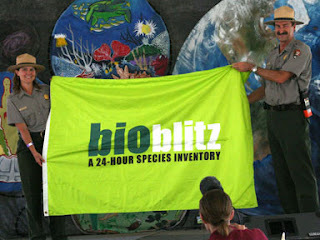 (Coronado National Forest volunteers will be among those who participate in the event.) To avoid potential conflicts for citizens who wish to attend the BioBlitz event and also participate in the National Environmental Policy Act (NEPA) process regarding the Rosemont Copper Project DEIS, the meeting will be rescheduled at a later date, to be announced. DEIS, the Coronado will reschedule the meeting at a later date, to be announced. Protection Agency’s Notice of Availability of the DEIS in the Federal Register. informational sessions and comment sessions. Oral statements made during the comment session will be recorded. Written comments will also be taken at the meetings. Citizens do not need to be present at any meetings to comment on the DEIS. Requirements for commenting may be found at 36 Code of Federal Regulations Part 215. November 12, 2011, 1:00 p.m. to 5:00 p.m.
November 19, 2011, 1:00 p.m. to 5:00 p.m.
December 7, 2011, 5:30 p.m. to 8:00 p.m.
December 10, 2011, 1:00 p.m. to 5:00 p.m.
Brief oral comments can be made by calling toll-free (888) 654-6646. Written comments may be mailed to: Rosemont Comments, P.O. Box 4207, Logan, UT 84323. (.docx), rich-text format (.rtf), or portable document format (.pdf). may call (520) 388-8300 voice or (520) 388-8304 TTY. A magnitude 2.1 earthquake occurred at 9:03 am local time south of Lake Mead and east of Boulder City, NV, according to the USGS. Our stakeholder community showed up in force to testify in support of continuing the Survey. They described the value of the data and reports we provide to industry, government, and academia, and the responsiveness of the Survey in meeting stakeholder needs. So, thanks to all of you who spoke up on our behalf. And thanks to the staff of AZGS for the tremendous work they do, to meet the needs of Arizona and its people. We will continue to work hard to earn your respect, protect our communities from natural hazards, and pursue wise development of our resources for economic growth. 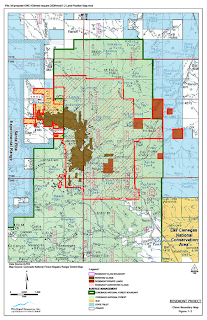 The Arizona Legislature invites public comment on whether the Arizona Geological Survey should continue, be terminated, or consolidated with another agency. This is the final step in the normal Sunset Review for all state agencies and boards. AZGS was last given a renewal 10 years ago, that expires June 30, 2012. 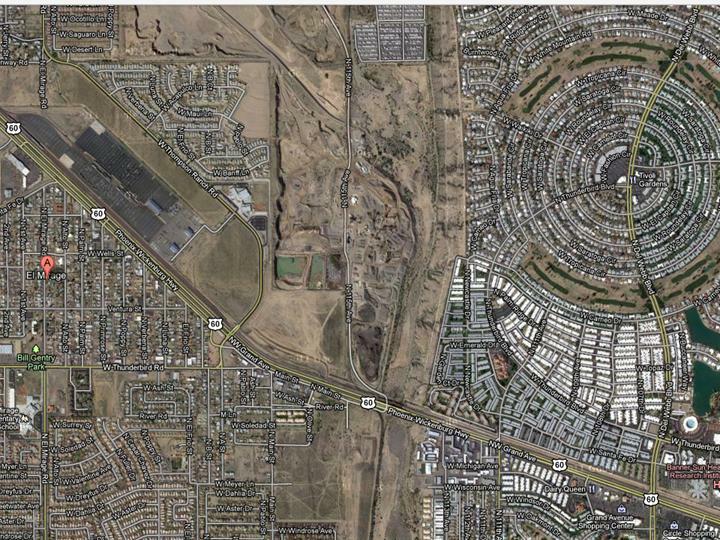 A public hearing is scheduled for 1:30 pm, Monday, Oct. 17 at the State Senate in Phoenix. The AZ Dept. of Game & Fish Commission Sunset Review is up first, with AZGS expected to be considered around 2:30 pm. A 10-member Legislative Committee of Reference is co-chaired by Sen. John Nelson and Rep. Kate Brophy-McGee. The Committee has until Dec. 1 to make their recommendations to the full Legislature, which will then be considered during the regular session beginning in January. However, it appears likely that the Committee will take action on Monday as to the future of AZGS. The Forest Service Environmental Impact Statement [EIS] is expected to be released for public comment late this month. An updated version of the widely used text "Structural Geology" by UA geosciences professor emeritus George Davis was unveiled yesterday by its publisher John Wiley at the Geological Society of America annual meeting in Minneapolis. The previous edition of the book was published 16 years ago. The new edition should be available by mid-November. Marcia McNutt, Director of the USGS, told the AASG mid-year meeting attendees that the USGS needs to weigh in on the unprecedented challenges facing state geological surveys. She specifically called out the threats to shut down the Louisiana Geological Survey, saying if there was any state that has the needs for dynamic geological survey, it's Louisiana. AASG is meeting at the GSA annual meeting in Minneapolis. Marcia said she and her senior management team are working on a strong public statement about the role and and importance of State Geological Surveys. We are here in Minneapolis at the annual meeting of the Geological Society of America, with 7,000 others, as one of the largest and most important scientific gatherings in the geosciences for the year. Last night at the Presidential Awards ceremony, AZGS geologist Joe Cook was recognized as the winner of the John C. Frye Award for outstanding environmental geology publication. The award will be official given Tuesday morning to Joe, accepting on behalf of himself and co-authors. 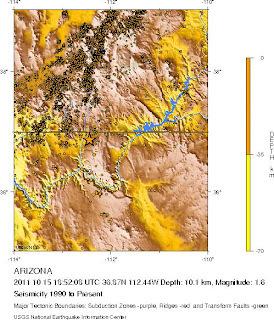 AZGS scientists are authors on nine technical presentations being given this week. My talk on the State Geothermal Data network was the first one up, on Sunday morning. We also rolled out publicly the first demonstration of the user interface for the geothermal data system at the State Geologist's booth in the exhibit hall. We'll be doing live demos and getting feedback through Wednesday. We spent Saturday stranded at the Phoenix airport after our US Air flight from Tucson was delayed, causing us to miss our connection. It was 10 hours before they could find seats for us on another flight to Minneapolis. We finally got to the hotel at 1 am Sunday and had to scramble early Sunday morning to get the exhibit up and running before the hall officially opened. But everything is working well and the demos are attracting a lot of attention and discussion. I'll try to provide updates over the next few days on what Arizona geologists are presenting here but there is so much going on and we have so many commitments, it's going to be a challenge to stay current. 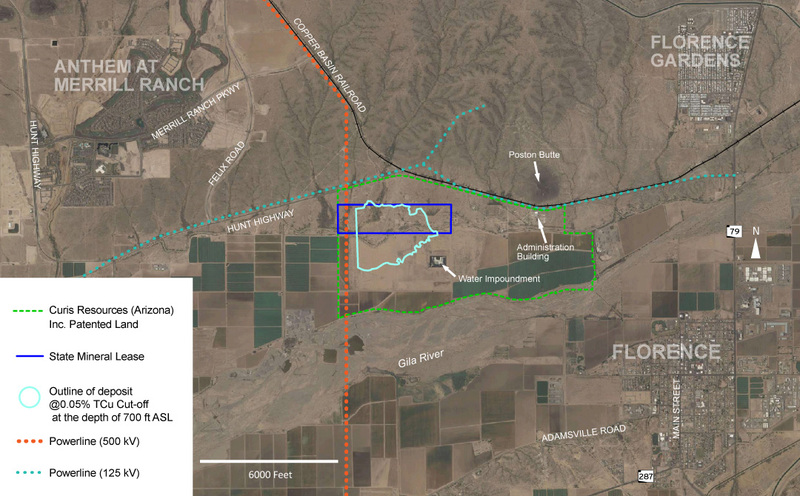 Emotions are running hot over a proposal to produce copper from underground deposits in the town of Florence, using an in situ leaching process. We've received some of the most impassioned messages we've ever gotten, in opposition to the recovery operation, repeating concerns over water and contamination first raised by real estate developers who fear that the copper project will reduce the value of planned residential and commercial projects. 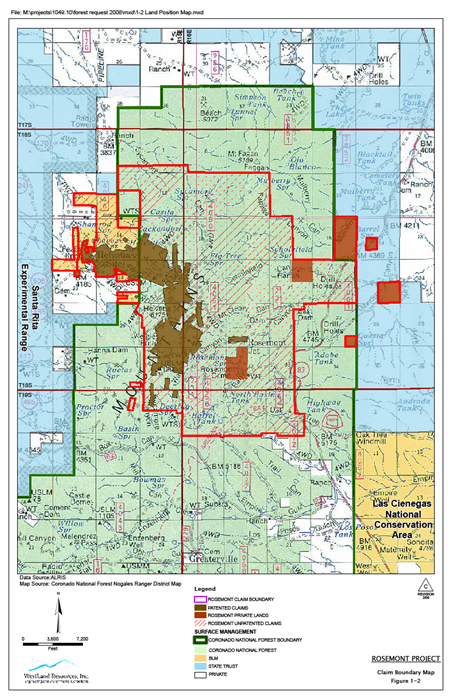 [right, air photo of copper project site relative to developed areas. Credit, Curis Resources]. A recent report by Montgomery & Associates, paid for by the Town of Florence seemed to predict no substantial groundwater problems would be caused by the project but that has been rejected by mining opponents. In advance of a Florence town hearing scheduled for early this evening, copper company Curis Resources announced it is creating a "multi-year, multi-million dollar economic development, community development and revitalization fund" tentatively named CREED — Copper Recovery Enhances Economic Development. The Florence Blade-Tribune reports that "the fund will benefit economic development, downtown revitalization, community service projects and charitable organizations in Florence and Pinal County." Also today, Cronkite News published a summary of the potash exploration around Holbrook with an emphasis on the possible impacts on Petrified Forest National Park. They confirmed an early report that "American West Potash has agreed to locate its surface facilities outside the park boundary with input from park officials. The event will be on the UA campus in the OSIRIS-REx Building, 1415 N. 6th Ave., in Tucson. We understand parking is limited so car-pooling is encouraged. Mike died Sept. 21. 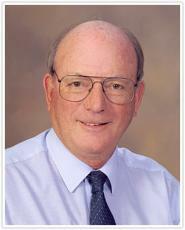 He joined the UA planetary sciences faculty in 1973 and headed LPL and the planetary sciences department since 1994. He was the principal investigator of the most ambitious UA project to date, OSIRIS-REx, an $800 million mission designed to retrieve a sample of an asteroid and return it to Earth. OSIRIS-REx is due to launch in 2016. It is the largest grant or contract the UA has ever received. His passing has drawn national attention. A new report from the USGS asks the question about the future of rare earth elements [REE]—will these high-tech industry elements continue in short supply? Author Keith Long concludes that "REE will continue to find increasing use due to their unique properties. There is a realistic possibility around 2015-2016 of sufficient REE capacity to meet demand under conditions of healthy price competition. REE supplies will be tight and prices high for a few years. There is significant downside risk that newly developed mines will not perform as planned. You can view a video presentation of this report that the author made on May 26, 2011 at the USGS Evening Public Lecture Series in Menlo Park, Calif. http://online.wr.usgs.gov/calendar/2011.html). The report was produced at the USGS Western Mineral and Environmental Resources Science Center, Tucson Office at the University of Arizona. 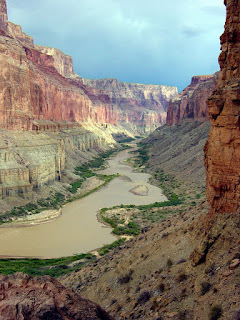 A 2010 Colorado River symposium, held in Flagstaff, Arizona, involved 70 participants who engaged in intense debate about the origin and evolution of the Colorado River system. 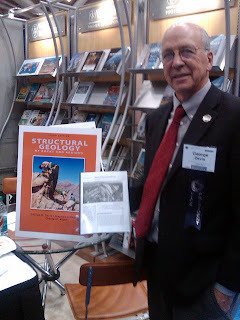 This symposium, built upon two previous decadal scientific meetings, focused on forging scientific consensus, where possible, while articulating continued controversies regarding the Cenozoic evolution of the Colorado River System and the landscapes of the Colorado Plateau-Rocky Mountain region that it drains. New developments involved hypotheses that Neogene mantle flow is driving plateau tilting and differential uplift and new and controversial hypotheses for the pre-6 Ma presence and evolution of ancestral rivers that may be important in the history and birth of the present Colorado River. 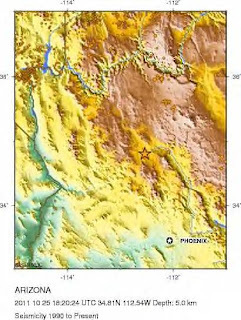 There is a consensus that plateau tilt and uplift models must be tested with multidisciplinary studies involving differential incision studies and additional geochronology and thermochronology to determine the relative importance of tectonic and geomorphic forces that shape the spectacular landscapes of the Colorado Plateau, Arizona and region. In addition to the scientific goals, the meeting participants emphasized the iconic status of Grand Canyon for geosciences and the importance of good communication between the research community, the geoscience education/interpretation community, the public, and the media. Building on a century-long tradition, this region still provides a globally important natural laboratory for studies of the interactions of erosion and tectonism in shaping the landscape of elevated plateaus. The USGS released 3 annual reports on Active Metal and Industrial Mineral Underground Mines in the United States, for the years 2007, 2008, and 2009. No mines are reported in Arizona. According to the latest report, "Total domestic mining and waste removal for nonfuel mineral materials production at underground operations was 138 million metric tons (Mt) in 2009. Crude ore mined at these underground operations was 136 Mt. The balance was waste removed, including ore and waste from development. Total underground mining for industrial minerals amounted to 123 Mt, nearly all of which was crude ore. Underground mining for metal ores and waste removal amounted to 15 Mt, of which 90% was crude ore."
Gov. Jan Brewer signed a Declaration of Emergency on Friday, in support of Coconino County response, recovery and mitigation efforts to protect property and infrastructure in the Schultz Flood area, in the Flagstaff area. The declaration was signed in response to a heavy monsoon rainstorm that dropped more than 1 inch of rain within 15 minutes in the Timberline, Hutchison Acres and Wupatki Trails neighborhoods on Sept. 13, 2011, causing significant street flooding and damage. Flood waters also undermined the utility of previously placed protective structures. Major construction is required to restore them to their pre-disaster condition. Gov. Brewer is authorized under state statute to declare a state of emergency and release an initial $200,000 from the Governor’s Emergency Fund. This money will be used to pay for emergency response costs and to repair public infrastructure, such as the roads that suffered damage as a result of this event. These funds are not available to repair individual homes. Coconino County continues to supply sandbags to property owners in high flood-risk areas. Residents with questions can call the Schultz Flood hotline at 877-679-8390. There was a small earthquake last Thursday on what appears to be the southern extent of the Hurricane fault in northwestern Arizona.